Maria Bello is held hostage by Stephen Dorff this November on Blu-ray. 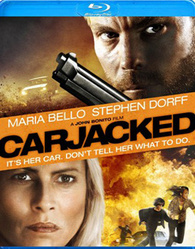 In an early announcement to retailers, Starz/Anchor Bay is working on 'Carjacked' for Blu-ray on November 22. The thriller directed by John Bonito ('The Marine') follows a single mom and her son after they are taken prisoner by a bank robber. The Blu-ray will feature 1080p video, a Dolby TrueHD 5.1 soundtrack, and the disc will include a Behind-the-scenes featurette. Suggested list price for the Blu-ray is $29.97. You can find the latest specs for 'Carjacked' linked from our Blu-ray Release Schedule, where it's indexed under November 22.